Dinner here is no fast-to-fade one-night stand. 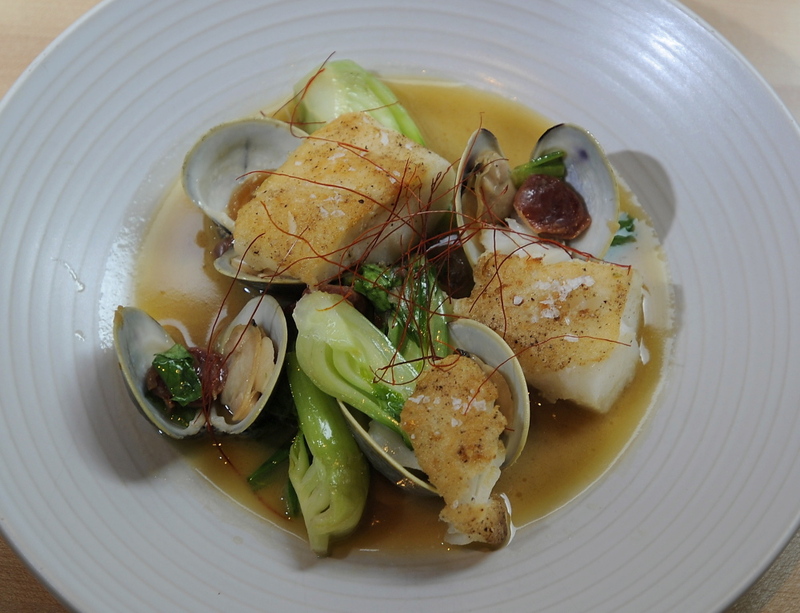 The Roasted Casco Bay Cod dish includes littleneck clams, soy brown butter, bok choy and Chinese fermented sausage. Love at first sight can be joyful – and unnerving. The sense of delirium that accompanies a first encounter is tempered by caution. Can this be real? Is it as good as it seems? And, all too quickly, have I lost my mind? Good news. 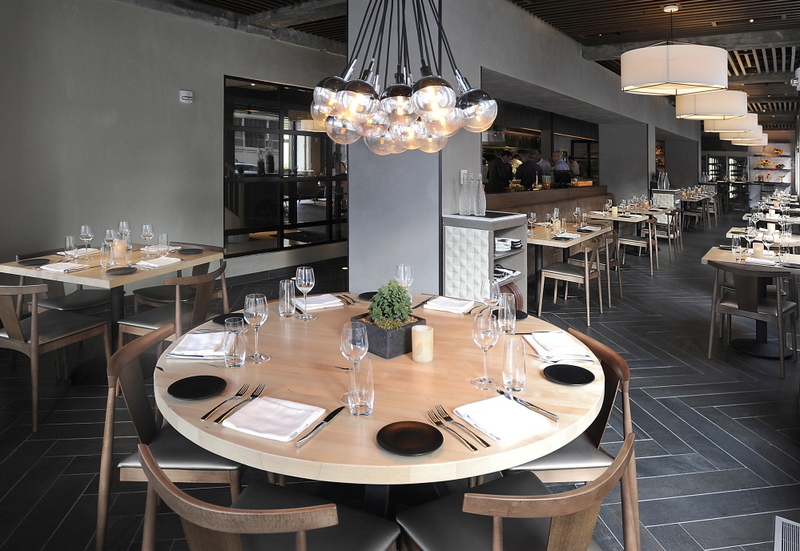 Union, the restaurant that opened four months ago off the lobby of Portland’s new Press Hotel, is the real thing – a contemporary American farm-to-table restaurant that grabs you with its good looks, then sweeps you off your feet with dishes as delicious as they are ravishing. Dinner here is no fast-to-fade one-night stand. It’s a relaxing opportunity to savor and enjoy executive chef Josh Berry’s assured and consistent cooking. And you’ll wake up the next morning with a very broad smile on your face. The Bee’s Knees features pistachio cake, lavender gelato, brown butter, honey powder and local bee pollen served on a slate. 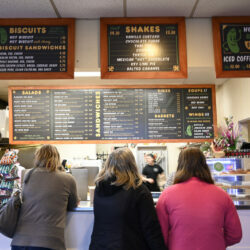 SERVING: Dinner 5:30 to 10 p.m. daily, breakfast 7 to 10:30 a.m. daily, lunch 11:30 a.m. to 2:30 p.m. daily; and Sunday brunch noon to 3 p.m.
BOTTOM LINE: Union, located inside the revitalized Press Herald building on Congress Street, is a stunning new restaurant with an impressive farm-to-table menu that celebrates local ingredients. Start with the compressed peach salad, a combination of sweet summer peaches, smoked (!) blueberries, prosciutto, tender young kale leaves and cool ricotta. Then try panisses, ultra-light, fried chickpea cakes (think hummus – with wings) served with two sauces: a lemony aioli and a rich, thick tonnato. (Inside tip: These are compulsively good. Order one dish for the table, and then get one for yourself.) Roasted Casco Bay cod is mild, delicate and moist, and served with a quartet of sweet Littleneck clams and slices of fatty Chinese sausage. Equally good (comfort food at its most comforting) is the Cornish hen with hominy and bacon, served in a fragrant truffle broth. Desserts here, while good, are a bit more prosaic. Best is the sweetest of the bunch, the “Bee’s Knees,” a plate of pistachio cake, lavender gelato and honey butter dotted with local bee pollen. The crunchy grains of pollen are intense and floral and dissolve quickly on your tongue. Happily, the delight of dinner at Union lingers. The menu is thoughtfully designed, too, and divided into categories: charcuterie, salads, starters and small plates, plus a variety of fish and meat entrees grouped by preparation: “Grilled,” “Braised and Sautéed,” “Roasted” and “Pan Seared.” There are also two pasta and grain options. Berry, a Maine native who previously worked at the Stowe Mountain Lodge in Vermont and The Balsams in New Hampshire, has a flair for elevating simple appetizers with bold accompaniments. Red curry adds spice to a chilled coconut soup; smoked blueberries (about which more later) infuse kale salad with haunting sweetness and fragrance; and – memorably – his lip-smacking lemon aioli and salty tonnato sauces animate a plate of panisses ($12). Our waitress described this appetizer as “garbanzo fries” but that’s like calling Dom Perignon “bubbly.” The airy, ephemeral, bite-sized pillows of fried chickpea batter are golden brown, sprinkled with a shower of salt and served with dribbles of those two sauces, one bright the other briny. Panisses at Union are lighter than fried polenta wedges, crisper than French fries – one bite and they dissolve, revealing a tender, almost custardy interior. There were six on the plate – a tease. They were gone in an instant; I had to satisfy myself, instead, by mopping up the remaining aioli with a piece of oatmeal bread. Those smoked blueberries appeared in a refreshing salad ($13) of peach slices, kale and prosciutto dressed with olive oil and topped with a scoop of ricotta. Each ingredient was distinct and intense (who knew blueberries could taste sweet and smoky at the same time? ), but layered together on a fork, the contrasting flavors were sublime…salty ham with sugary fruit, smoky berries and creamy cheese. Some salads leave you feeling virtuous – but bored. Not this one. 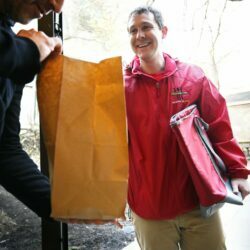 Union spotlights ingredients from local suppliers and, according to the waitress, a commitment to building relationships with the state’s farmers and fishermen is what inspired the name. “Some people think it’s because we’re in the old Press Herald building, and we’re referring to the pressman’s union…but the name was really chosen because we’re in union or partnership with producers across New England. We celebrate their dedication, and we serve their ingredients with pride.” The kitchen treats those ingredients with respect. 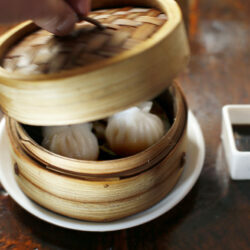 Not only are they cooked with care, they’re presented exquisitely. (In sight of diners, one cook meticulously assembled an entree with a practiced eye and a pair of surgically wielded chopsticks. Take the roasted Casco Bay Cod ($28). Served in a broad-rimmed ceramic vessel – half bowl and half plate –the fish was dusted with scarlet Korean chili threads and surrounded by littleneck clams, a single head of baby bok choy, and slices of Chinese sausage ($28). The mild fish made an ideal foil for the clams, which exploded with salty liquor, and for the fatty pieces of fermented sausage. (That sausage was an unexpected delight. It had a tantalizing sugary taste, as if the pork had dipped briefly into a thin pool of syrup.) I closed my eyes to savor the smells rising from the soy broth at the bottom of the dish. As if reading my mind, a young waitress appeared out of nowhere with a spoon. It’s a pleasure – especially at a new restaurant –to find staff this professional, polite, relaxed and well informed. A friend’s roast Cornish hen ($27) looked – and smelled – nearly as good, the generous serving of meat piled onto a mound of gleaming, white hominy spiked with chunks of bacon and served in a broth perfumed with truffles. Imagine if chicken and grits had gone to finishing school in France. He was willing to share: each groan-inducing bite was balanced and deeply satisfying. Desserts at Union are tasty and occasionally inventive, though not quite as impressive as everything that precedes them. A rustic summer crostata ($9) of ripe stone fruits was sweet but the pastry lacked crispness and the scoop of sour cream ice cream on the side lacked tang. The Bee’s Knees ($9), a colorful testament to the work ethic of honey bees, featured a wedge of lavender gelato from Gorgeous Gelato, next to a piped line of meringue and a few dots of honey butter flecked with crunchy bee pollen. The slice of pistachio cake supporting this confection seemed an afterthought, but the gelato – good on its own – was even better drizzled with honey and scattered with a few tender (and unexpected) cilantro leaves. Love at first sight is intoxicating. Sure, you can take it slow and quell your appetite. Or you can let yourself fall, as I fell for Union. Infatuation never tasted so good.